Confession: I do not love dogs. I know, I know, we can’t be friends anymore. But don’t leave yet! It’s true, I’m not drawn to dogs in general–strange dogs pretty much scare me–but there are a few dogs in my past I’ve really liked. When I was 4, we had a black spaniel whom I named Liesel (shout out to The Sound of Music) and she had some incredibly cute puppies, Jason and Lucy. Then when I was about eight, my great grandparents got a dachshund puppy named Heidi. I wanted Heidi so much, I begged to take her home with me after staying one weekend with them. I shouldn’t have asked and they shouldn’t have said yes, but they did. So I got to keep Heidi for one week before my parents had me give her back. It was a good decision on their part, but I didn’t understand at the time. There weren’t any other dogs I until I was a teenager and one of my younger sisters begged for a puppy. She got little Trumpkin, a black lab-ish puppy, who was cute as can be. He met a tragic end very soon after joining our family. Then we got the most troublesome dog ever, and at that same time I started running in our rural area and found out that I really dislike country dogs who chase runners. Especially that Doberman down the street. I still like the idea of a good family dog. I was raised on James Herriot, so how could I not like that image? But I can’t reconcile myself to the risk involved with getting a dog—what if I’m no good at training it? What if it ruins everything? What if we pick out one with a vicious soul? What if we won’t even want to play in our backyard? How much does dog food cost? Etc. I know some day one of my children will want a dog so earnestly, I will have to give in. I just can’t be a mom who says she’s allergic to dogs when she’s really not. But I’m trying not to give them any ideas like “every boy should have a dog” or that sort of thing. The hard part is some of the best picture books are about dogs. Dogs in books = the best kind, in my opinion, but I doubt I can convince my two children of that. The cutest book dog is the one in The Puppy Who Wanted A Boy. His name is Petey and he all he wants for Christmas is a boy, but he struggles to find a boy who doesn’t already belong to a dog. I’m pretty sure I would have a hard time turning away a dog from my door who looked like Petey. Please, no one use this against me in the future. The little dog, Zip, in We Help Daddy is another book dog I wouldn’t be able to turn away if he showed up in real life. And what mother wouldn’t like Carl to show up and be her helper? I would probably freak out at first, but over time I’m sure I’d grow to appreciate him. One of my friend’s who has two daughters has made sure to tell them that if they ever see a dog who looks like Carl, they shouldn’t go up and pet him. 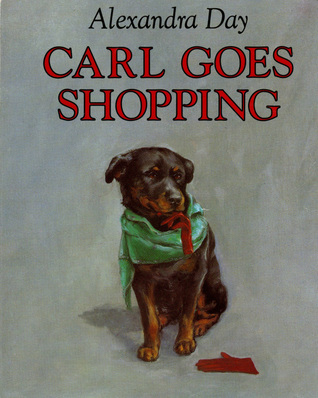 Carl is a great book dog, though. And then of course there are the big time book dogs, Clifford, Martha, and Biscuit. It’s probably only a matter of time before Biscuit has his own TV show. Now that I’ve pondered all the dogs in books that I think of fondly, maybe I’m not so far away from reconciling myself with a family dog as I thought I was. I’m sure I’d be overly selective, but it could happen sometime in the future. Just don’t tell my kids yet. This is Day 19 of the 31 Days of Picture Books Series. To read the rest of the series, go here.